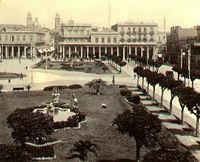 From left to right: Plaza Independencia, Solís theatre, World Trade Center Montevideo, Rambla Sur. Montevideo is the largest city, capital, and chief port of Uruguay. It is the only city in the country with a population over 1 million. It has a privileged harbor, one of the most important in the Americas, and beautiful beaches. Its quality of life is considered the highest in Latin America. Montevideo is the commercial, political, and intellectual center of Uruguay and is considered one of the continent's most important centers for learning and the arts. It is also headquarters for MERCOSUR, South America’s common market. As of 2004, Montevideo had a population of 1.35 million out of a total of 3.43 million in the country as a whole. The greater metropolitan area has 1.8 million people. Montivideans have very strong European origins, with Italian and Spanish descent being the most common. There are also important African-descent and Jewish communities. The city's architecture reflects the strong European influence. Montevideo's population makes up roughly 44 percent of the entire country of Uruguay. The surrounding province of Canelones, essentially Montevideo's suburbs and direct rural area, makes up another 12 percent. The Plaza Independencia, Independence Square. Montevideo lies at the midpoint of Uruguay's coast, where an estuary called the Rio de la Plata meets the Atlantic Ocean. The Avenida 18 de Julio is the city's main artery and extends from the Plaza Independencia, through the main business district. The park is surrounded by historic buildings that include the Government House (offices of the president and vice president), the Museum of Natural History, the Salvo Palace (once the tallest building in South America), the Solis Theater, and the Victoria Plaza Hotel. On the plaza is the black-marbled mausoleum of Independence leader Jose Gervasio Artigas, topped by an enormous statue of the national hero. The avenue gets its name from July 18, 1830, the date Uruguay adopted its first constitution. West of the plaza, an arch leads to a historic district called Ciudad Vieja or Old Town. This district has many buildings that date from the 1700s or 1800s. Northwest of Plaza Independencia is the city's most impressive landmark, the three story neoclassical Palacio Legislatvio (Congress Building), built in 1908. Montevideo's major tourist attraction is its 14 kilometers (8.6 miles) of beaches, connected through a beautiful promenade, locally known as the Rambla. 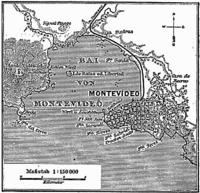 There are at least two explanations for the name Montevideo. The first states that it comes from the Portuguese Monte vide eu, which means, "I see a mountain." The second is that the Spaniards recorded the location of a mountain in a map as "Monte VI De Este a Oeste" meaning "The sixth mountain from east to west." 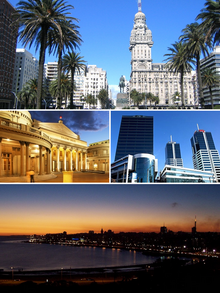 The city's full original name is San Felipe y Santiago de Montevideo. The first European to explore Uruguay was the Spanish navigator Juan Díaz de Solís in 1516. He and his group were killed by Charrúa or Guaraní Indians. The Portuguese explorer Ferdinand Magellan anchored at the future site of Montevideo in 1520, and the British navigator Sebastian Cabot led a Spanish expedition up the Río de la Plata in 1526. The area attracted little interest for settlement owing to a lack of mineral wealth and the hostility of the natives. This changed however, when in 1680, the Portuguese founded Colonia del Sacramento, across the Rio de la Plata from Buenos Aires, despite Spanish claims to the area based on the Treaty of Tordesillas. The Spanish forced the Portuguese out of a fort in the area in 1724. Then, Bruno Mauricio de Zabala—governor of Buenos Aires—founded the city of Montevideo on December 24, 1726, to prevent further incursions. From 1807 to 1830, Montevideo was alternately occupied by British, Spanish, Argentine, Portuguese, and Brazilian forces, and its trade and population declined. In 1828, the town became the capital of Uruguay. However, independence, which came in 1830, did not bring stability. Rivalries between local inhabitants, Argentines, and Brazilians led to a nine-year siege of Montevideo by a combined Argentine-Uruguayan army from 1843 to 1851. French and English forces assisted Montevideo's defenders by blockading Buenos Aires. The unexpected result was that Montevideo flourished during the siege and became the major port of the Río de la Plata. 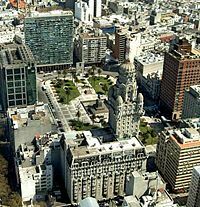 The city fell under British influence from the early nineteenth century until the early twentieth century as a way to circumvent Argentine and Brazilian commercial control. It was repeatedly besieged by Argentine dictator Juan Manuel de Rosas between 1838 and 1851. Between 1860 and 1911, British-owned railway companies built an extensive railroad network linking the city to the surrounding countryside. During the early 1900s Uruguay became one of the most prosperous and democratic nations in South America. Jose Batlle y Ordoñez, president from 1903 to 1907, and again from 1911 to 1915, initiated widespread political, social, and economic reforms that established a stateist tradition (The practice or doctrine of giving a centralized government control over economic planning and policy). Some of these reforms were continued by his successors. However, an economic decline during the 1950s and 1960s brought about a period of widespread unrest. In the late 1960s, a violent Marxist urban guerrilla movement called the Tupamaros carried out kidnappings and murders of Uruguayan and foreign officials. This led Uruguay's president to cede control of the government to the military in 1973. By year's end, the rebels had been crushed, but the military continued to expand its hold over the government. Civilian rule was not restored until 1985. In 2004, the left-of-center Frente Amplio (Broad Front Coalition) won national elections that effectively ended 170 years of political control previously held by the Partido Colorado and Partido Blanco parties. Since 2005, the Mayor of Montevideo (Intendente Municipal in Spanish) has been Ricardo Ehrlich, of the Frente Amplio, gaining 61 percent of the vote and beating Pedro Bordaberry of the center-right Partido Colorado, who scored 27 percent. Uruguay is divided into 19 departments (provinces) for purposes of local government. Voters in each department elect a governor and a legislature to handle departmental affairs. The chief executive, who is called the "Intendente Municipal," acts as a combined governor and mayor for the departmental capital. Since 2005 the governor and mayor of Montevideo has been Ricardo Ehrlich, of the Frente Amplio, gaining 61 percent of the vote and beating Pedro Bordaberry of the center-right Partido Colorado, who scored 27 percent. As the seat of national government, Montevideo hosts the offices of the president and vice-president as well as the bicameral General Assembly and the Supreme Court. Torre de las Telecomunicaciones (Antel Tower) in Montevideo. The military dictatorship of the 1970s and economic stagnation caused a decline whose residual effects are still seen today. Many rural poor flooded the city, with a large concentration in Ciudad Vieja. In 2002, Uruguay went through the steepest economic and financial crisis in recent history, which developed mostly from external factors. Uruguay’s economy rebounded in 2003—with a 2.5 percent rise in GDP—and surged in 2004 and 2005 with growth rates of 12.3 percent and 6.6 percent, respectively. Growth equaled 7.0 percent in 2006 and is expected to reach 4.5 percent in 2007. The Uruguayan government employs more than one-third of the workers of Montevideo. The city's important industries include textile manufacturing, banking, and tourism. Wines and dairy products also are produced. Most of Uruguay's exports and imports pass through Montevideo's port. Among the main exports are wool, meat, and hides. The port is also served by the Carrasco International Airport. Four railroads converge on the city, and roads lead to other principal cities. 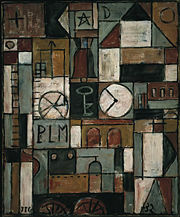 Many of the works of Uruguayan cubist paint and sculptor Joaquín Torres García can be seen in Montevideo. The city has an excellent system of public education and is the home of the University of the Republic and the Technical University of Uruguay. Higher education in Uruguay is available only in the capital. Despite its small size, Uruguay has made significant contributions to the arts in Latin America. Montevideo's greatest literary figure is the essayist Jose Enrique Rodo (1872-1917), who greatly influenced Latin American thought. The city's rich culture reflects the amalgam between people of European, African, and indigenous origins dating back to the sixteenth century. Interwoven into much of the city's and nation's folk music, art, and drama is the gaucho, the nomadic, free-spirited horseman and cowhands who roamed the pampas from the mid-eighteenth to the mid-nineteenth century. The importance of the arts and culture in Montevideo is reflected in the city's many museums and theaters. Montevideo's first theater was the Casa de Comedias, which opened in 1795. This was followed by the Teatro San Felipe. The Teatro Solís, still in existence, was opened in 1856. The city also houses the Museo Histórico Nacional (National History Museum, 1900), the Museo Nacional de Historia Natural (Museum of Natural History, 1837), the Museo Nacional de Bellas Artes (Museum of Fine Arts, 1911), and the Biblioteca Nacional del Uruguay (National Library, 1816). Montevideo is the center of Uruguay's publishing industry. Most of the country's daily newspapers are published here, with several having national circulations. Many of the major dailies are owned by or affiliated with the major political parties. The leading government and private radio and television stations also broadcast from Montevideo. Use of the Internet has grown rapidly since the mid-1990s. Soccer is the most popular sport in Montevideo and Uruguay. The city's Estadio Centenario (Centennial Stadium), is world famous, and hosted the 1930 FIFA World Cup. Other popular sports include basketball and rugby. Gaucho rodeos, called domos, attract many spectators. The city's fine beaches draw large crowds in the summer. ↑ Indicadores Demográficos del Uruguay. Período 1996–2025. National Statistical Institute. Retrieved May 19, 2012 (Spanish). ↑ Introducing Montevideo. Lonely Planet. Retrieved May 19, 2012. ↑ Montevideo. Encyclopædia Britannica. Retrieved May 19, 2012. ↑ Dictionary.reference.com, Dictionary definition. Retrieved September 25, 2007. Central Intelligence Agency. Uruguay. (2007). The CIA World Factbook. Retrieved September 25, 2007. Encyclopedia Britannica. Montevideo. Encyclopedia Britannica 2007 Deluxe Edition. Chicago: Encyclopedia Britannica, 2007. U.S. Department of State. Uruguay. Retrieved September 25, 2007. All links retrieved October 19, 2018. This page was last modified on 19 October 2018, at 15:56.